Volume 10 of the Routledge History of Philosophy presents a historical survey of the central topics in twentieth century Anglo-American philosophy. 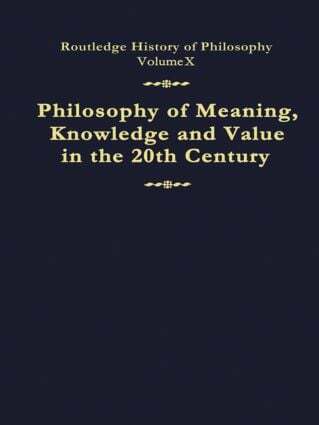 It chronicles what has been termed the 'linguistic turn' in analytic philosophy and traces the influence the study of language has had on the main problems of philosophy. Each chapter contains an extensive bibliography of the major writings in the field. All the essays present their large and complex topics in a clear and well organised way. At the end, the reader finds a helpful Chronology of the major political, scientific and philosophical events in the Twentieth Century and an extensive Glossary of technical terms. John V. Cranfield lives in Toronto. He has taught philosophy at Cornell University and the University of Toronto, and is the author of Wittgenstein: Language and World (1981) and The Looking-Glass Self (1990). He is currently working on Wittgenstein's private language argument.